Before the ink was dry on the $120 billion war-funding package passed without withdrawal deadlines by the U.S. Senate and House on May 24, Sen. Hillary Rodham Clinton, D-N.Y., returned her focus to her campaign with this: “If President Bush does not end the war, when I am president, I will.” It has become a mantra (slogan, if you will), repeated on her blog. As senator? Not so much. Last I heard, Congress still had some power. Why are they willing to wait until 2009 (or beyond) to end a war the majority of Americans wanted to end with the influx of Democrats they voted into office last year? In the Democratic debate on June 3, Sen. Joseph Biden, D-Del., mentioned getting 2,500 mine-resistant V-shaped armored vehicles into Iraq by August to “save lives,” and he has pushed this idea several times since. It seemed oddly specific, so I looked it up. Those vehicles are called MRAPs, or Mine Resistant Ambush Protected vehicles. They will not be available by August. They will not be available until 2009, at a cost of $900,000 each. The U.S. Army plans to buy 2,500 MRAPs over the next three years, at a cost of $2.25 billion. The U.S. Marine Corps plans to replace its 3,700 Humvees in Iraq, which will cost $3.7 billion. That’s a sweet $6-billion deal for some defense company. Do Biden and his colleagues want to prolong this war another two years so they can fulfill contracts? According to The Center for Responsive Politics, the defense industry gave more than $48 million to elected officials since 2002. 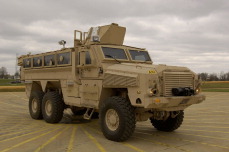 Two of the companies that make MRAPs are BAE Systems and General Dynamics, two of the top defense contributors. GD has given $4.5 million to elected officials, and BAE has given $2 million since 2002. Let’s look at some of the 2008 presidential candidates. Rep. Duncan Hunter, R-Calif., took $246,410 from the defense industry in 2006, including $20,000 from BAE. Sen. Christopher J. Dodd, D-Conn., took $96,800 in 2006. Clinton took $72,200 in 2006, including $8,000 from BAE. Sen. Sam Brownback, R-Kan., took $53,500 in 2004, including $1,000 each from BAE and GD. Sen. John McCain, R-Ariz., took $2,000 in 2006 and $18,000 in 2004. Rep. Tom Tancredo, R-Colo., took $1,000 in 2006 and $2,000 in 2004. As for the Democrats who recently refused to end the war, the 25 senators who voted for the war funding in May have taken money from defense companies, while only 12 did not. The 66 representatives who voted for the funding taken money from defense companies, while only 20 did not. Whose interests do they really serve? The fact that so many of our people are profiting greatly from the war, and given the PR slogan “Support Our Troops”, it seems that way too many people are so entrenched in activites making money for themselves (and their campaigns) while we are at war, without regard for the troops they say we are to support, that they are not supporting our troops, but ONLY THEMSELVES!! The best support we can give our troops is to get them out of Iraq NOW not some time convenient for making money. We need people in our U.S. Government who are truly committed to the welfare of Americans!